Building typologies can serve as a basis for analysing the national housing sector. During TABULA seven of the project partners carried out model calculations which aimed at imaging the energy consumption and estimating the energy saving potentials of their national residential building stocks (IWU / Germany, NOA / Greece, POLITO / Italy, VITO / Belgium, STU-K / Czech Republic, SBi / Denmark, ZRMK / Slovenia). The partners chose different modelling approaches depending on the available statistical data. Some defined a set of synthetical buildings reflecting building stock averages, others were applying a set of “generic” example buildings from the national TABULA typologies. The results show that the model calculations can provide plausible projections of the energy consumption of the national residential buildings stock. The fit of model calculations and national energy statistics is satisfactory, deviations can often be explained and corrected by adapting standard boundary conditions of the applied calculation models to more realistic values. Some partners made estimations of possible energy savings, e.g. by applying “standard” or “advanced” packages of energy saving measures to the whole building stock. In that way high potentials of energy savings and CO2 reduction in the residential building sector could be documented. Comparison of model results with national Energy balance 2006 ([TJ], final energy consumption). 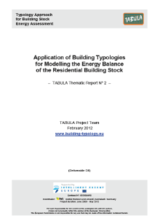 In general, the analysis shows that building typologies can be a helpful tool for modelling the energy consumption of national building stocks and for carrying out scenario analysis beyond the TABULA project. The consideration of a set of representative buildings makes it possible to attain a detailed view on various packages of measures for the complete building stock or for its sub-categories. The effects of different insulation measures at the respective construction elements as well as different heat supply measures including renewable energies can be considered in detail. The quality of future model calculations will depend very much on the availability of statistical data. For reliable scenario analysis information is necessary about the current state of the building stock (How many buildings and heating systems have been refurbished until now?) and about the current trends (How many buildings and heating systems are being refurbished every year?). The availability and regular update of the relevant statistical data will be an important basis for the development and evaluation of national climate protection strategies in the building sector.